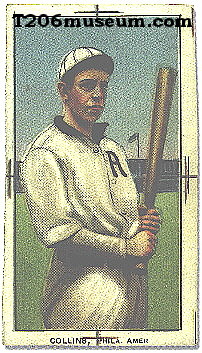 Out of 520+ cards from the T206 set, there is only one Eddie Collins card which is in portrait pose. However, in the late 1970's, there was a batting pose of Eddie Collins T206 card surfaced. Such batting pose has never turned up on any issued card. That card has a blank back with the crossed registry lines on the front. The reason why this pose was not used in T206 is still a mystery. This unique Eddie Collins proof was owned by Charlie Sheen and sold for $24,930 on April 28, 2000 at Leland's Auctions.